Unlike, convertible debentures, Non convertible debentures (NCD’s) are those debentures which are not convertible into equity shares and carried with specified coupon rate payable in four options: monthly, quarterly, annual and cumulative interest. The tenure of the NCDs can be anywhere between 2 years and 20 years. They are listed on stock exchanges, hence, provides liquidity to holder. Such debt bonds are normally rated by credit rating agencies like CRISL, CARE and ICRA. A NCD can be secured and unsecured as specified by the company. Secured NCD are backed up by some assets which can be liquidated for paying off the bond holders in case company is in financial crunch. For this reason, the returns on secured NCDs are lower than unsecured NCDs. On the flip side, unsecured NCD are the ones which are not backed by any assets and in case something goes wrong, there can be an issue in paying back the bond holders. Only after the payment is made to every entity which has some security, the unsecured NCD bond holders have any chance of getting back their money. So that’s the reason why these NCD’s have high interest rates. 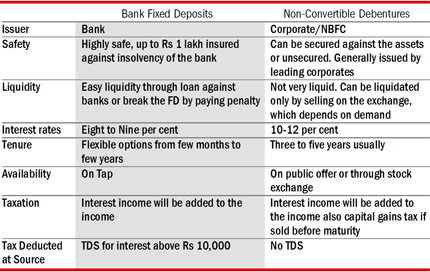 Undoubtedly, NCDs provide you the opportunity to earn 2-3 percentage points higher return than other fixed-income instruments such as bank fixed deposits, being a retail investor, you are indeed spoilt for choice.However, in the current economic environment the negatives and risks outweigh the 200 basis points premium the issue has over fixed deposits. Fixed deposits for three years and five years are currently giving around 9-9.5%. A plain comparison on returns would suggest no scope for debate, as several companies issuing NCDs are promising double-digit rates, much more than bank or company FDs. But wait before taking a decision, as the apparent returns are just one way of looking at things. The risk element also needs to be considered. Also Read: How can go for Company Fixed Deposits Schemes? An investment offering higher returns invariably comes with additional risk. The biggest risk with NCDs is the possible capital loss in case of increase in interest rates. NCDs have a fixed coupon or interest which is paid to the holder of the instrument at maturity. If you sell an NCD in the secondary market when the interest rate is higher than that being offered by the debenture, your return will be less or even negative as the buyer will pay only that amount which allows him to get the return equal to the prevailing market rate. If the interest rate goes down, your effective return will be higher than that being offered on the NCD. Apart from the risk of lower return or loss of capital, there is the risk of default by the company even though the chances are low as most of the firms are under supervision of the RBI and SEBI. NCDs are also listed on stock exchanges. This allows investors to liquidate the bonds even before maturity. However, there is no active market for NCDs on the wholesale debt market segment of the stock exchanges and their liquidity is low. You might not be able to find a buyer for your NCDs if their trade volumes on exchanges are insignificant as you may have to wait till maturity. Though, the NCDs issues becoming more opaque with each passing day, investors should evaluate a NCD and see that what are key indicators based on credit rating realizing that credit rating may change multiple times during the span on a NCD that they need to look into. Besides, an investor should also look business areas of the company and the purpose for which the amount is being raised also needs to be checked. One should keep exposure limited in high coupon NCDs and depending upon risk appetite, decide exposure in these NCDs and keep in mind at following points. Should you invest in them? At present, the lure for investors is high. They are always on the prowl for good investment opportunities. Before taking the ride on the NCDs, investors must be considered, firstly on their financial goals and asset allocation and then on their risk-reward profile. They should not fall prey to the temptation just because these are offering good interest rate because they should understand the risk involved in this as compared to bank’s fixed deposit. But consider your comfort with the company fundamentals and industry before you buy. Also Read: Spend Time while buying financial products!